As fans eagerly await each Sunday’s Game of Thrones episode, there is a behind-the-scenes battle happening to ensure video quality remains high while the likes of Amazon, Netflix, and HBO continue to push content that viewers can’t stop binging on. A lot happens to video data on its path from the camera lens to viewers’ eyes, and all that compression, encoding, and transmission can lead to a lower quality that audiences can see with their naked eyes. In fact, the naked eye has traditionally been the best measure of video quality, but video companies are eager to use technology to be able to check more content at different points along the path to viewer’s eyes. A new study from the University of Waterloo found SSIMWAVE’s SSIMPLUS to be the most accurate and most comprehensive measure of video quality. Take a look at the results below or download the one pager. SSIMWAVE’s perceptual video quality measure beats VMAF for speed, accuracy and completeness. 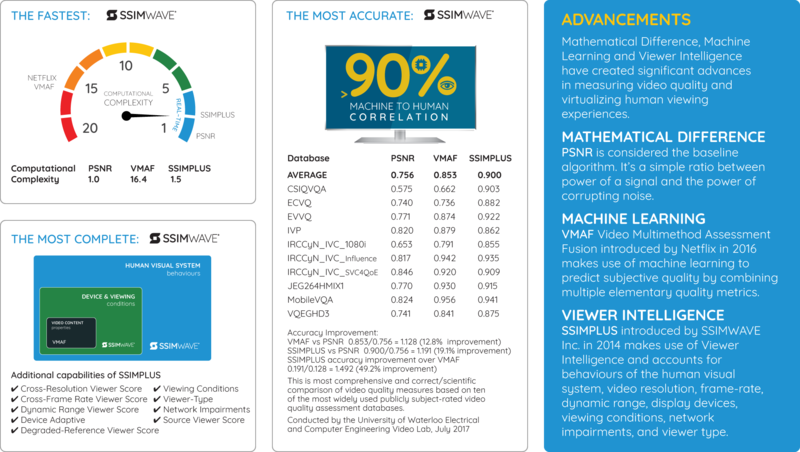 In fact, SSIMPLUS proves to be 10x faster with a 49% improvement in accuracy beyond VMAF using PSNR as a baseline. A lot happens to video as it travels between the glass that captures it and the glass that displays it. It’s a complex combination of configurations balancing ‘quality’ with the realities of bitrates, encoding parameters, servers, delivery networks and consumer devices. What matters most is the quality of what the human viewer sees. Current processes test configurations and outputs with mathematical difference quality measures and human experts aptly named, ‘golden eyes.’ The process of relying on humans doesn’t scale for today’s explosion of video consumption. The question the industry is asking, “Can we trust computers to the task?” Some would argue never, but SSIMWAVE’s SSIMPLUS is out to prove otherwise by narrowing the gap between objective (modeling/predicting/measuring) and subjective (human opinion scores). Researchers and the industry have been working on closing this gap (See Advancements) but to get computers close to how humans perceive video and for them to work in real-world environments, the solution better be comprehensive, highly accurate, real-time fast, and pay attention to how and where individuals experience moving pictures. The results of this test are proof that future is here with SSIMPLUS. The best part of industry and researchers striving towards the same goal is that publicly available datasets are available so that anyone can put the different perceptive quality measures to the test against real videos and real people. The comparison shown was conducted by the world-renown video lab at the University of Waterloo. We encourage you to run independent tests. The datasets, tools and resources containing reference videos (representing sports, news, action, cinema, animation) and grades (human opinion scores) of hundreds of thousands of real people are all publicly available. Click here to download instructions and the full results.